With spring collections being released one after the other, pastels and soft colors﻿ are very trendy right now, even more so if they happen to have a shimmer of some kind. H&M Peppermint Fusion has both : a beautiful dusty periwinkle shade with a strong yet subtle matching shimmer. Just like all the other H&M nail polish I have tried so far, I had zero application issues : 2 easy, even coats was all it took to achieve this fresh and soothing color. 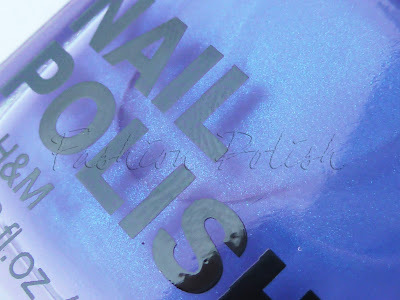 I had a really hard time photographing this nail polish, the purple undertone just wouldn't behave...The nail swatch is the most color accurate but the bottle pic really shows the amount of shimmer in the polish. I think I just found my favorite periwinkle, what's yours? It is very original!! I've never seen such a color. Is this available in shops in France? I hope I can find this here in the US, thanks for sharing! oui ruxi il est dispo en france j'ai acheté le mien a h&m val d'europe ! This polish is awesome! Love it! Love this color! I need to try these H&M polishes!